Have you ever wondered what the atoms look like in the materials around you? Are they all lined up in neat little rows or do they fit together in a cool pattern? How can we find out if we don’t have a super powerful microscope? One way to tell how the atoms are arranged is to grow crystals with the material. 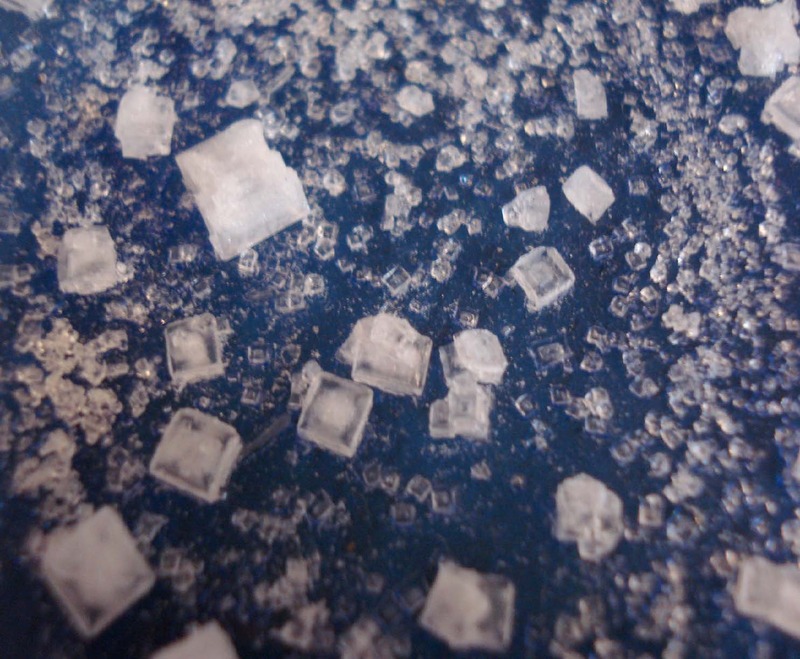 Many everyday materials such as sugar and salt can be used to grow crystals. Crystals are simply a structure where all of the atoms are perfectly arranged on the atomic scale. On the scale that we can see, this turns into very smooth lines and unique shapes. For example, if the atoms arrange themselves in a cube, with straight columns and rows (like rock salt), the resulting crystal will be a cube with smooth sides. In this activity you will grow a couple different types of crystals using everyday materials. You will then observe the shape of the crystals and use them to picture how the atoms may be arranged. This activity may take up to a couple of weeks and would be perfect for a science fair project! *Washing soda is found in the laundry section of some grocery stores. The national chain stores do not usually have it, but many of the local stores do. You can call 1-800-524-1328 and ask what stores in your area carry washing soda. Use caution when boiling water. Activity First, you need to know a little bit about the conditions for growing crystals and why they grow. This will allow you to make your own modifications to the process to get the best crystals. All crystal making begins with a saturated solution. This is simply a solution that cannot hold any more of the material. For example, if you are making a saturated solution of salt water, you would add salt to the water until no more could be dissolved. Eventually the salt will start collecting on the bottom of the container because the water cannot hold any more salt. Crystals grow when the solution becomes supersaturated, meaning that there is too much salt dissolved in the water. The extra salt (or other material) takes the form of crystals. To get a supersaturated solution you can either cool down the solution or let some of the water evaporate. To begin, make some Epsom salt crystals. These are easy to grow and you will begin to see crystals in a couple of hours. Start with one cup of warm distilled water (not boiling). Start adding Epsom salts by the spoonful and stirring until they dissolve. Continue doing this until not more Epsom salts can be dissolved (this will probably be about one cup). Let the mixture sit for a couple of minutes until all of the undissolved salt is on the bottom of the container. Slowly pour off the solution into a shallow bowl, but stop pouring before you get to the undissolved salt. Put the bowl in the refrigerator for 3 hours. You should see some crystals beginning to grow. What do they look like? What shape and color are they? You have just made crystals using the cooling method. Next, make some alum crystals using the evaporation method. Again, being with some hot distilled water. Start with a small amount, ¼ to ½ a cup will be fine. Start adding the alum by the spoonful and stirring until it dissolves. Follow the same method as above to make the supersaturated solution and pour off the solution, leaving the undissolved crystals behind. Use a small saucer or plate to grow the crystals. This will allow for maximum surface area for the volume of solution you have, increasing the evaporation rate. Let it sit (not in the refrigerator) for a couple of days. You may begin to see small crystals form after an hour or so from the cooling of the solution, but if not, don’t worry! You will see a crystal garden begin to grow within a day. Examine your crystals. What shape are they? How big is your biggest one? Smallest? How long did it take for the first crystals to form? Use the evaporation method used to make alum crystals with table salt, sugar, washing soda, and borax. The crystals pictured on the right are table salt crystals. Have patience! Some of the materials may not begin to form crystals for a couple of days or even a week! You may add food coloring to the solution if you want colorful crystals. Use the below table (see PDF) to record your observations. Knowing that salt has a cubic atomic structure (straight rows and columns) and seeing the resulting crystals that it forms, can you guess what the atomic structures of the other substances are by looking at the crystals? After growing the crystals and guessing what the atomic structures may look like, go on the Internet and search for them! How close were you? s the solution becomes supersaturated when the water evaporates, the extra salt molecules will add onto the existing seed crystal, and it will grow! You may need to repeat this process if your crystal stops growing to get very large crystals! Try experimenting with the process for each material. What happens if you use hotter or cooler water? Do you get bigger or smaller crystals if you put a fan in front of the evaporating dish (speeding up evaporation)? What other variable can you change? Record all of your work. To grow crystals you must start with a saturated solution. As the solution cools or evaporates it will become supersaturated, causing crystals to form. As the crystals form the atoms have a certain arrangement that they will settle into. By looking at the larger crystal you can get an idea of how the atoms are arranged on the atomic scale. By using a seed crystal you can grow quite large crystals as the solution becomes supersaturated.